Thrish's research laboratory is mainly focusing on soft robotic systems that can learn to adaptively change their stiffness to maintain stable interactions with uncertain objects and environments. His robotics work is supported by several European Union research grants and the UK Engineering and Physical Sciences research Council (EPSRC). The red palm weevil detector is a solution to a problem that the Sri Lankan Coconut Institute asked Thrish to address. Thrish used his robotics background and found an effective early detection solution, now he wants to make it possible for Sri Lankan farmers to use his innovation as currently the prototype is too expensive. We can dramatically reduce the cost by building an app. Thank you Tweet: For helping give Sri Lankan farmers have piece of mind and affordable way to protect their livelihoods we will personally thank you on twitter! Early Bird App plus accessories: Be one of the first Sri Lankan farmers to receive the app. You will be one of the first palm farmers to have the app and as one of the first users you will be involved giving us feedback which will help us shape the app to meet your needs. This offer is excessive for the first 20 supporters. App plus accessories: Be one of the first Sri Lankan farmers to receive the app. You will be one of the first palm farmers to have the app and as one of the first users you will be involved giving us feedback which will help us shape the app to meet your needs. Thank you postcard: Put this postcard on your wall, your fridge, or your bathroom mirror and feel good about supporting Sri Lankan farmers! Ticket to coconut and weevils seminar: Thrish will be hosting a seminar talking about the problems Sri Lankan farmers face through red palm weevils, how the problem is currently managed and how his technology will help Sri Lankan farmers and improve coconut yields. In the seminar Thrish will explain his journey in developing this promising tool for the detection of Red Palm Weevils, discussing the device and the progression into the app he is currently funding. Ticket to coconut and weevils seminar and drinks: After Thrish's seminar, you can relax with him and other guests at an exclusive drinks reception, where you can talk to Thrish and ask him anything from how he became interested in developing technology for agriculture, to how he went about transforming his algorithm into an app. Limited Edition Print: Artwork inspired by the science. 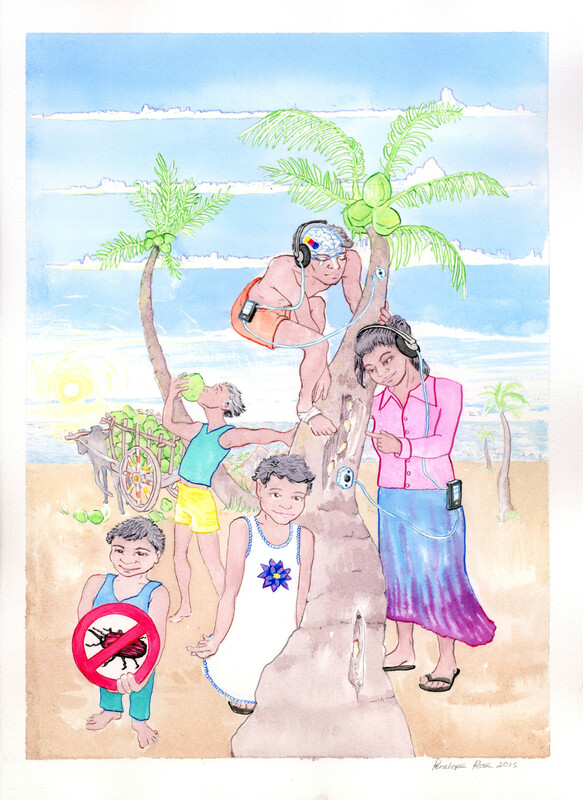 This artwork has been created by Penelope Rose, the man up the tree is using the detector to listen for the distinctive crunching sounds the weevils make. The auditory cortex is highlighted in red, yellow and blue. These colours represent the low, medium and high sound frequencies. The clouds in the back indicate the sound waves from the crunching sound which are amplified by the app so the farmer can detect them through the auditory cortex. Sponsor 5 Sri Lankan farmers: This pledge will guarantee an 5 farmers to have access to the detector. Limited Edition Canvas Print: Artwork inspired by the science. 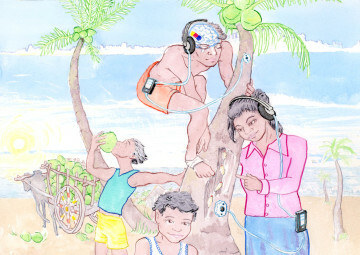 This artwork has been created by Penelope Rose, the man up the tree is using the detector to listen for the distinctive crunching sounds the weevils make. The auditory cortex is highlighted in red, yellow and blue. These colours represent the low, medium and high sound frequencies. The clouds in the back indicate the sound waves from the crunching sound which are amplified by the app so the farmer can detect them through the auditory cortex. Sponsor the transducer with your logo: This is aimed at businesses who work with coconut farmers in Sri Lanka, your logo will be on the transducer which is an add on device that the farmers need to use the app. If you work with Sri Lankan farmers this will help you increase your brand image with the local farmers. What are red palm weevils and what do they do to coconut trees? 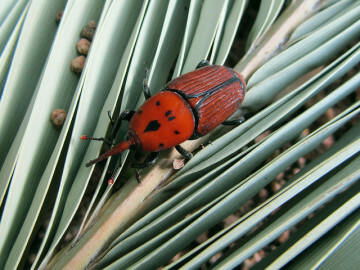 The red palm weevil is the main pest of the palm tree. They lay their larvae inside the tree and can breed at an astronomical rate. The larvae start by eating the inside of the tree. The tree will eventually show signs of bleeding and when this happens all that can be done to treat the tree is burning. Farmers also sometimes try painting the tree in diesel to kill the larvae, this method is unproven. 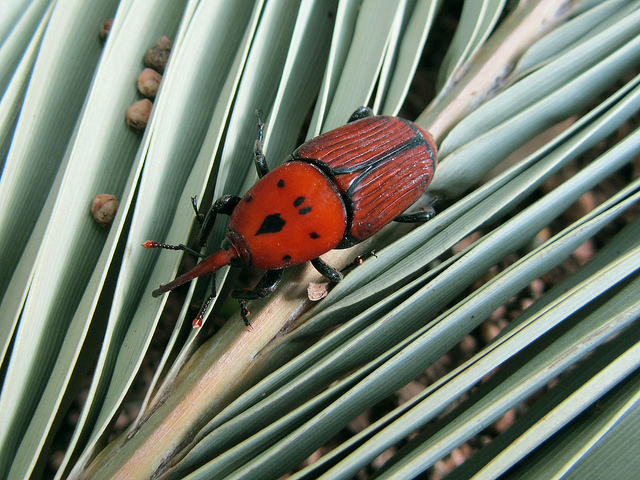 A red palm weevil, this little bug costs the palm industry millions and has a psychological affect on farmers with low incomes in developing countries. What does this mean for coconut farmers? For Sri Lankan coconut farmers red palm weevils are a kind of silent killer (unless you have the detector), for Sri Lankan farmers it is very hard to know what trees they are living in until it is too late. Once they have a foot hold in a plantation they can easily spread to multiple trees meaning that the farmer can end up loosing many trees in one go. Each tree produces around 60 coconuts per year, however that is just the tip of the iceberg. Every part of the coconut tree can has commercial value to farmers, therefore when they lose a tree it is very distressing. It takes 5 years for a coconut tree to reach maturity so the lost of a tree is incredibly significant to low income farmers with small holdings. What is the current solution? Dr Thrish Nanayakkara, who has many friends and family in Sri Lanka started working on a solution several years ago after a friend asked him if he could find a way to solve this problem. Thrish, who has a background in robotics rather than parasitology approached the problem from a new angle to those who had already tried to tackle it. He decided not to read a single paper on parasites and started working on the problem with a fresh set of eyes. First, he looked at the mechanics of the red palm weevil and discovered they made a very rhythmic crunching sound as they chowed down on the palm tree from the inside. He wondered whether this distinctive sound could be used to identify the red palm weevils at an early stage but he had a problem, Sri Lanka is tropical and there is a lot of background noise, particularly from birds and other insects. So Thrish then brought in some computer science to the solution and built a device that could amplify the crunching sound the weevils made. It’s a bit like how a doctor uses a stethoscope, the doctor is trained to be able to detect abnormal sounds in the heart. The device requires a similar level of human interaction, the farmer is given an example recording of what to listen out for and then uses the device to amplify the sounds inside the tree and he listens out for the red palm weevils just like a tree doctor. Below is a short video clip showing a farmer using the device. An estimated 10% of palm production is damaged by red palm weevils, Sri Lanka alone produces over 2 million tonnes of coconuts per year. Many of the farmers are small holders with low incomes and for them every coconut counts. The annual damage in Sri Lanka is estimated to be around £15million and causes significant economic and social problems. Prior to Dr Nanayakkara invention there has been no reliable sensor to detect this pest in the larvae stage. By detecting it in the larvae stage it means chemical treatments can be applied rather than the alternative of finding the red palm weevils at a late stage and having to burn down the whole tree. Coconut trees take 5 years to reach maturity so prior to the detector the farmers just have to hope that they do not have weevil larvae inside their trees. Dr. Nanayakkara, in collaboration with the Sri Lanka agricultural council has already developed a portable electronic device that has been found to be very accurate at detecting larvae at an incredibly early stage. This device has already been recommended by the coconut research institute (CRI) to more than 5000 farmers in Sri Lanka as the best detector available. Why is it necessary to build an app if there is already a detector? Cost. The cost of the detector is £40, this is very expensive for Sri Lankan farmers, to put this in perspective this is 8000 rupees which in rural parts of Sri Lanka could be a whole months rent. Despite this, the majority of Sri Lankan’s have smart phones and the device that Dr. Nanayakkara has developed lends itself perfectly to being integrated into an app that could be downloaded for a few pounds. For helping give Sri Lankan farmers have piece of mind and affordable way to protect their livelihoods we will personally thank you on twitter! You will be one of the first palm farmers to have the app and as one of the first users you will be involved giving us feedback which will help us shape the app to meet your needs. This offer is excessive for the first 10 supporters. You will be one of the first palm farmers to have the app and as one of the first users you will be involved giving us feedback which will help us shape the app to meet your needs. Put this postcard on your wall, your fridge, or your bathroom mirror and feel good about supporting Sri Lankan farmers! This artwork has been created by Penelope Rose, the man up the tree is using the detector to listen for the distinctive crunching sounds the weevils make. The auditory cortex is highlighted in red, yellow and blue. These colours represent the low, medium and high sound frequencies. The clouds in the back indicate the sound waves from the crunching sound which are amplified by the app so the farmer can detect them through the auditory cortex. Thrish will be hosting a seminar talking about the problems Sri Lankan farmers face through red palm weevils, how the problem is currently managed and how his technology will help Sri Lankan farmers and improve coconut yields. In the seminar Thrish will explain his journey in developing this promising tool for the detection of Red Palm Weevils, discussing the device and the progression into the app he is currently funding. After Thrish’s seminar, you can relax with him and other guests at an exclusive drinks reception, where you can talk to Thrish and ask him anything from how he became interested in developing technology for agriculture, to how he went about transforming his algorithm into an app. £40 – Limited Edition Print: Artwork inspired by the science. This pledge will guarantee an 5 farmers to have access to the detector. In return the farmer will record the amount of coconut loss to red palm weevils before and after having access to the detector. There are hundreds of farmers across Sri Lanka who could benefit from the detectors. Our aim is to help as many as possible. £300- Limited Edition Canvas Print: Artwork inspired by the science. This is aimed at businesses who work with coconut farmers in Sri Lanka, your logo will be on the transducer which is an add on device that the farmers need to use the app. If you work with Sri Lankan farmers this will help you increase your brand image with the local farmers.